Paytm garnier color naturals offer in which you can get Rs 50 Paytm cash for free. 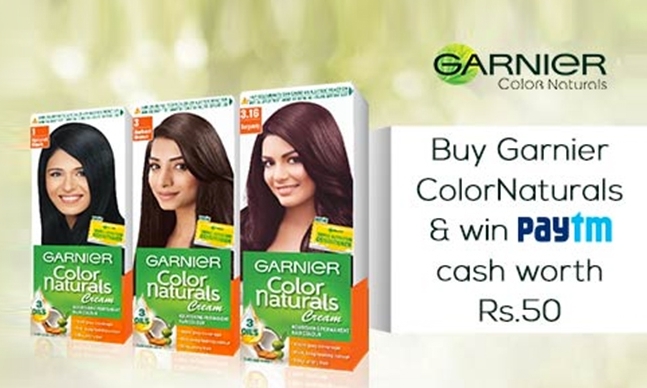 Buy a garnier color naturals pack worth Rs 170 and get paytm cash code worth Rs 50. Use this cashcode on link below and paytm cash would be credited into your wallet instantly. Paytm Garnier offer is currently working fine and you can avail paytm cash through this offer without any hassles. 1. Visit nearest store and buy Garnier Color Naturals Pack of Rs 170. Check paytm offer Label mentioned on pack. There are also some Packs which are available without this paytm cash offer. 2. You will get the Paytm cash code from the inside the garnier colour naturals pack. 4. Enter the paytm cashback promo code which you got from the Garnier Pack. 5. Login or Create new paytm account. 6. Rs 50 free Paytm cash will be credited into your account instantly which can be used to do recharges, shopping etc at paytm. 3. A single user can avail the offer 2 times. 4. Offer only valid on those packs on which offer is mentioned. 186 Responses to "Paytm Garnier Color Naturals – [Working] Rs 50 Paytm Cash"